Citation Information: JCI Insight. 2017;2(14):e94249. https://doi.org/10.1172/jci.insight.94249. Our previous work showed myocellular differences in pediatric and adult dilated cardiomyopathy (DCM). However, a thorough characterization of the molecular pathways involved in pediatric DCM does not exist, limiting the development of age-specific therapies. To characterize this patient population, we investigated the transcriptome profile of pediatric patients. RNA-Seq from 7 DCM and 7 nonfailing (NF) explanted age-matched pediatric left ventricles (LV) was performed. Changes in gene expression were confirmed by real-time PCR (RT-PCR) in 36 DCM and 21 NF pediatric hearts and in 20 DCM and 10 NF adult hearts. The degree of myocyte hypertrophy was investigated in 4 DCM and 7 NF pediatric hearts and in 4 DCM and 9 NF adult hearts. Changes in gene expression in response to pluripotency-inducing factors were investigated in neonatal rat ventricular myocytes (NRVMs). Transcriptome analysis identified a gene expression profile in children compared with adults with DCM. Additionally, myocyte hypertrophy was not observed in pediatric hearts but was present in adult hearts. Furthermore, treatment of NRVMs with pluripotency-inducing factors recapitulated changes in gene expression observed in the pediatric DCM heart. Pediatric DCM is characterized by unique changes in gene expression that suggest maintenance of an undifferentiated state. Transcriptome profile of pediatric dilated cardiomyopathy (DCM) patients (n = 7 DCM and 7 nonfailing [NF] pediatric hearts). (A) Heatmap of the 1,260 significantly changed genes (two-sided Wilcox rank-sum t test, P ≤ 0.05). (B) GSEA enrichment profiles in DCM patients and NF controls. 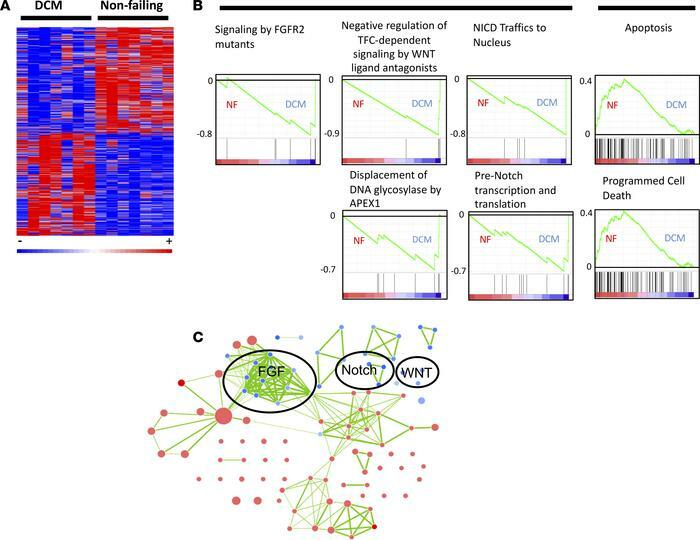 These profiles highlight the influence of a small cohort of genes involved in FGF, WNT, and NOTCH signaling in DCM patients (heatmaps of enriched genes are provided in Supplemental Figure 1). Genes are represented by vertical bars, and enrichment is represented by a green line. (C) Cytoscape network of the significantly enriched pathways in both DCM and NF patients. Blue represents pathways associated with DCM patients, and red represents pathways associated with NF controls. Each node represents a single enriched pathway, and each link represents a gene common between pathways. The network accentuates the high degree of crosstalk between enriched pathways.